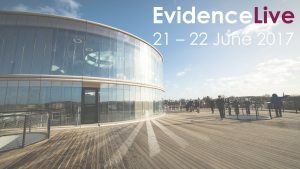 On behalf of the Evidence Live Programme Committee thank you for joining us at our 7th Evidence Live conference in Oxford last month. During the planning stages we very much consider what the output will be for our delegates and hope that we meet our objectives. We were fortunate to have a wide range of high profile speakers from across the EBM population and associated organisations, content, quality of the topics covered and inclusivity all received positive feedback during the event. All further comments are gratefully received, please take a minute (or five) to complete the FEEDBACK QUESTIONNAIRE so that we can keep on improving on the experience.